Founded in 1960, Thai Airways, also styled as "THAI", is Thailand's national flag carrier airline. Their primary hub is Suvarnabhumi Airport based in Bangkok, but they also maintain a secondary hub at the airport on the Thai island of Phuket. The fleet of aircraft operated by Thai Airways consists mostly of Airbus and Boeing jets. They offer international flights to 63 destinations in 36 different countries. These countries are located in three world regions: the Asia Pacific, the Middle East, and Europe. As a founding member of the Star Alliance airline partnerships scheme, Thai Airways range of international destinations is vast due to a large number of codeshare partnerships with other major airlines, including Air Canada, Japan Airlines, Emirates, and Air New Zealand. 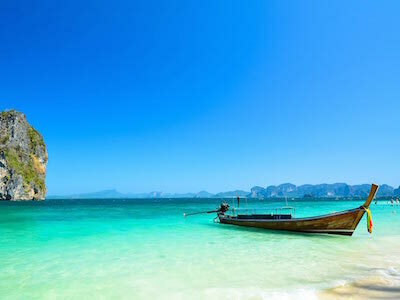 The airline also operates domestic flights to ten destinations, including Chiang Mai, Udon Thani, and several major southern destinations, such as Phuket and Koh Samui. 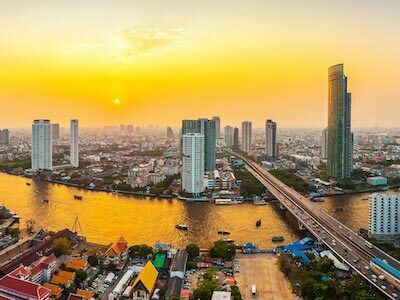 Their domestic southern routes enable a large number of tourists to travel from Bangkok to many of the kingdom's popular mainland and seaside island resorts. Thai Smile is a subsidiary airline owned and operated by Thai Airways. They are also a major shareholder of Nok Air, a low-cost airline, of which they hold 39% ownership of the company. How do I check-in online with Thai Airways? You can check-in online via the Thai Airways website. Simply select the "iCHECK-IN" tab located on the left-hand side of their webpage. The online check-in page can also be accessed through the"MANAGE MY BOOKING" tab, which is located on the top of the webpage. After navigating to the check-in page, enter your surname and booking number into the text fields to complete your check-in. Online check-in is available up to one hour prior to your flight's departure, but not earlier than 24 hours before your scheduled flight. Please keep in mind that the airport's check-in counters close 40 minutes before scheduled departure times. The online check-in service also allows Royal First Class passengers and Royal Silk passengers to pre-order onboard meals, including vegetarian, kosher, halal, and other special dietary requirement dishes. Pre-orders should be placed 24 hours in advance for outbound flights from Bangkok, and 48 hours in advance for incoming flights to Bangkok. What is my checked baggage allowance on Thai Airways? Thai Airways baggage allowance for checked baggage depends on the class of ticket purchased. Royal First Class customers are allowed up to 50 kg of checked baggage free of charge. Royal Silk and Economy Premium customers are allowed up to 40 kg. Economy Class customers can check-in 30 kg of baggage. Royal Orchid customers, as well as those with booking references that start with the letter ‘L’, are limited to a maximum of 20 kgs of checked luggage. In addition, those flying with infants that are not occupying a seat are allowed an additional 10 kg of free baggage Baggage allowances can vary if your flight involves airline transfers. If your baggage exceeds weight limits, extra fees will be applied. The above allowances apply only to international routes. Domestic flights have different baggage allowance policies. What hand luggage can I take on Thai Airways? Thai Airways hand luggage policy is limited to one bag, which should not exceed a total length, height, and width of 115 cm (45 inches). In addition, passengers may also carry an additional small personal item, such as a purse or laptop bag. The maximum weight limit for hand luggage is 7 kg (15.4lbs). If your hand luggage exceeds the size or weight limitations, it must be checked-in as hold baggage. In addition, Thai Airways publishes a lengthy list of items and materials that are not allowed on board, including knives, scissors and other sharp objects. Up to 20 spare batteries or power banks can be carried in your hand luggage, provided that no more than two of them exceed a maximum power rating of 20,000mAh. Power banks between 20,000mAh and 32,000mAh can be carried on as part of the 20-battery allowance. Batteries or power banks with a power rating greater than 32,000 mAh are not allowed in hand luggage. In addition, batteries and power banks are prohibited from checked-in hold baggage as well. Where does Thai Airways fly from? It was a smooth flight, overall!